Double Ruffle 3-pc. 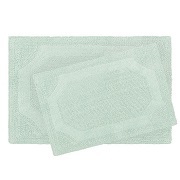 Bath Rug Set - 17"x24", 21"x34", 24"x40"
Nicole Miller Newton Textured Border 2-Piece Bath Rug Set 17"X24"; 21"X34"
It’s all too easy to overlook the importance of bathroom rugs. Just imagine taking the most refreshing and soothing shower or bath you’ve had in a long, long time. Brushing aside the shower curtains, some warm and fluffy bath towels are waiting to envelope you inside their luxuriously soft embrace. Drying off, you step out of the tub and onto the cold, cold tile floor—and in a second, you’re jolted out of that smooth and relaxed state of mind! Or worse, you end up taking a nasty slip backward into the tub. Avoid this exact scenario by investing in a set of bathroom rugs. 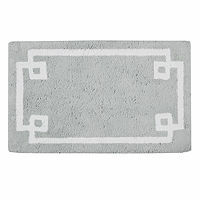 Not only do they protect your feet, they’re an invaluable way of adding some color and variation to the bathroom! Coordinate with the shower curtain or the color of the wallpaper and create a bathroom design language that speaks of warmth, comfort and peace of mind. Look out for that slippery floor! Add strategically placed bath mats or bath rugs right under where your feet go—it’s surprising how much they can help out! Some have memory foam to help cushion and pamper your feet after a relaxing bath—how divine it feels! Many feature non-skid and non-slip material for stable footing. You’ve probably felt that cold touch of icy tile when you step into the bathroom first thing in the morning, which then jars you out of your sleepy morning daze. 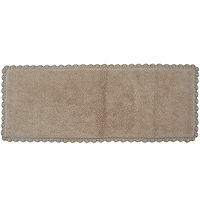 Adding comfy, cozy bath mats to your bathroom is one way to avoid such an abrupt awakening. Buy mats separately or in a collection, which includes mats of various sizes and a toilet lid cover. 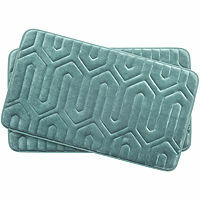 Whether its separates or a collection, a rousing red or tame green, your bath mats from JCPenney are sure to be a welcome addition to the rest of your colorful bed and bath collection.